If you have a brick and mortar company Google+ Business is perhaps the most cost effective way to market your business. Google’s mantra has always been to give the user the best possible experience. They know that 97% of consumers look for local business online. Thus they recognize the importance of local search and recently made some sweeping changes in response to this demand. Google+ Business and Google Search are directly linked and Google Search is the largest search engine in the world. 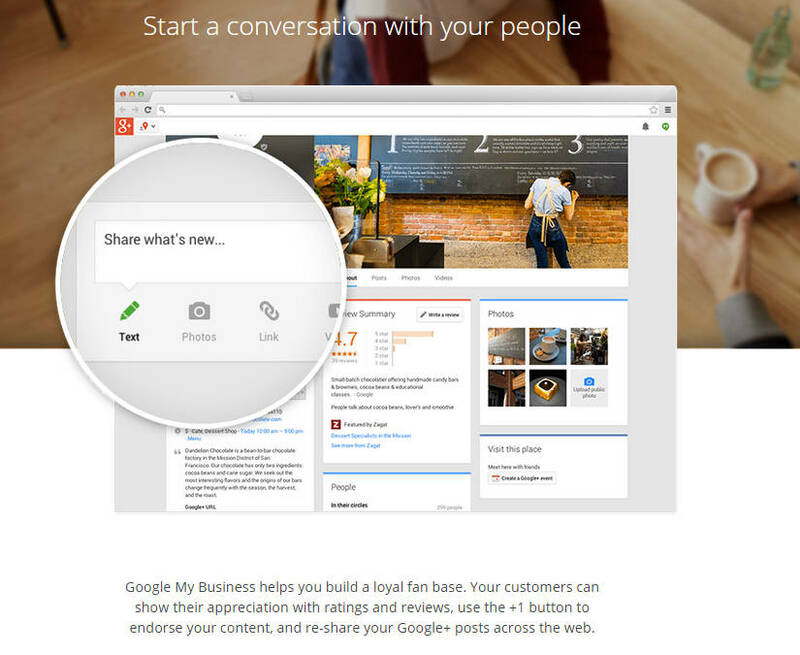 Thus it’s imperative that any local business create and optimize its Google+ Business page. This short primer will discuss best practices to ensure that your Google+ Business page ranks well and serves as powerful magnet to attract customers to your store. First and foremost claim your listing. Unbeknownst to you Google is usually able to glean information about your company and create a simple Google+ Business page. However, this is a very thin page and you should claim it so you can manage the page. The easiest way to go to http://plus.google.com/pages/create Follow the wizard, and choose the most appropriate option to classify your business. You will then need to verify the business sometime they will send a postcard or make a phone call to the number associated with your account. This procedure ensures that only the actual owner of the business can make changes to the page. Once you are verified you can administer your account. Below are some best practices. 1: Edit your business information – In this section you list basic company information there’s also a spot for a description of your company. This should be short but compelling and persuasive. You also can list various categories. Please make certain you belong in the categories. Lastly don’t skip and sections, 100% completing is critical for high rankings. 2: Add photos and videos – You can add up to 10 photos and 5 videos. At the very least you should upload 5 photos. Maxing out your photos and videos will really help push you to the top. 3: Get reviews – 90% of people trust reviews from people they know, but 70% trust reviews from people they don’t know. This is way reviews are so important as they establish “social proof”. However, it’s very difficult to get customers to add reviews to your Google+ Business page. That’s the bad news, the good news is that all your need is a handful of reviews to climb to the top. Lastly too many reviews can actually hurt you, ideally you want to get a maximum of one review a month. 4: Monthly postings. Writing a short blog post about your business is a great way to engage your audience, learn about and show of your knowledge. 1: How to get high rankings – Complete all section, add photos with good description, try and get one review a month. Add a new post once a month. 2: How to handle bad review – Respond publicly, this can be a PR win because it proves that you take review seriously. Negative feedback can be helpful, they might be correct. You can adjust and then publicly thank them. Also a few negative reviews adds authenticity to your overall listings. Plus we all know that nobody can make everyone happy all the time. 3: Why isn’t my listing showing up in the search results – Google+ Business is starting to get competitive, it’s imperative to follow the steps outlined here. 4: Why is there already a listing for my business – Google spiders can crawl the web and create pages on their own. 5: Why do I need to claim my listing – You now control and have access to stats, such as how people asked for directions to your business. The entire crew at Walden Pond love the water. It’s not uncommon to find us sailing to Block Island, clamming or catching a 25 pound strip bass from a kayak. As a matter of fact, 10 years ago one of our graphic designers was a lobster fisherman. 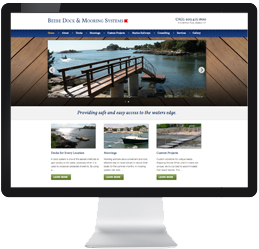 Thus we jumped at the chance to work Bruce and Don from Beebe Dock & Mooring Systems. Their new site looks great and ranks for their important keywords. Below are some thoughts from Bruce. “These guys understand communications strategy and are flawless at executing this strategy. Plus, they know how to tie a line. You laugh, but finding people as passionate about the marine industry who are also expert marketing communicators is no easy task”. We recently launched a Marine Marketing Division; to learn more please click here. New sites looks great, but traffic doesn't !! I have heard this story too many times and feel it’s time to share the remedy. A successful E-commerce company recently launched a new site. The new site looked great and they anticipated a positive bump in sales. Wow were they disappointed. Sales were off almost $10,000 thirty days after the launch of the new site. They contacted me in a panic. It took our engineers about 5 minutes to diagnose the problem. All of the page names were changed and Google wasn’t notified. This would be similar to a restaurant moving across town AND changing its telephone number to an unpublished number. Let me explain what happened, the real customer name will not be revealed. Google indexes websites on a regular basis and uses its proprietary logarithm to determine how they rank a particular page. Google ranked many of his pages on the first page of search results. So as an example a person looking for “blue plastic folding widgets” would see his page appearing on the first page. Note Google would list the web address and a specific page. So Google would list www.bluewidgets.com/folding.html. However, if the new site renamed that page to www.bluewidgets.com/folding-plastic.html the old page would no longer work. A person clicking on that link would get the dreaded 404 error, or “page not found”. The shopper would then go back to Google and the click on a different web address, bypassing www.bluewidgets.com. This type of activity would dramatically reduce sales. The solution is very simple, yet it’s surprising how few web designers understand the correct procedure for launching new sites. Reusing the same page names is one solution, but a better solution is to create what is referred to a as a “301 Redirect”. Basically you provide Google and other search engines with a map of the old pages and the corresponding new page pages. In this example we would map “www.bluewidgets.com/folding.html” to “www.bluewidgets.com/folding-plastic.html”. So when a person clicks on the old page that automatically are redirected to the page. Eventually Google removes the old page from its search results and shows the new page name. Sad to say most web designers don’t use 301 redirects. The result is that the clients have to wait for Google to index the new pages, which can take between one to three months. Once the problem was explained to the client and 301 redirects traffic and sales quickly were restored to their previous levels. 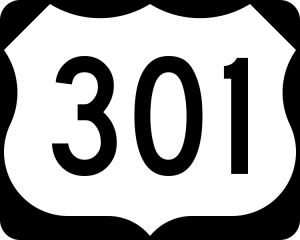 In closing, when are you ready to discuss launching a new website with your designer make certain they are familiar with 301 redirects. 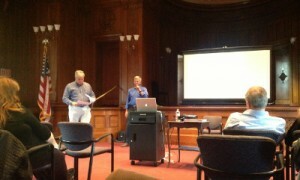 Jeff Buxton and I presenting our Mobile Seminar at the Blackstone Library in Branford May 14. Mobile web design is a new technology that small businesses will need to embrace in order to remain competitive. Thus we felt it was important to share our experience. Click here to learn more about Mobile Website and request a free preview of a mobile version of YOUR website. Learn three ways mobile websites are moving businesses forward and the top 5 practices to creating a mobile site your customers will love. The mobile web is exploding. More and more consumers access websites with their smartphone. By the end of this year it’s projected that more people will use their smartphone than their PC to get online. Are you happy with the way YOUR site looks on a smartphone. We are offering a free Mobile seminar at the Blackstone Library in Branford Tuesday May 14th at 4:30. Click here to request a free mockup of a mobile design of your current website.